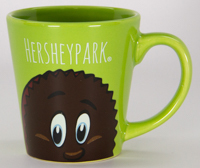 Features Reese's character on a green background. Recommended to hand wash with gentle dish soap. This mug is NOT dishwasher or microwave safe.